Fracking is in the news a lot these days. It's a technique to extract oil and natural gas from formerly inaccessible places. And it promises to deliver untold billions of dollars to those who use it. Good news: The same thinking behind fracking can extract new profits from your business. All you need do is drill deeper using different techniques than before. And it's not NEARLY as hard or expensive as real fracking. This is fracking. It takes years and costs millions of dollars. Example: If clients don't buy as often as you'd like, why not simply ask them to buy on a schedule that you choose? 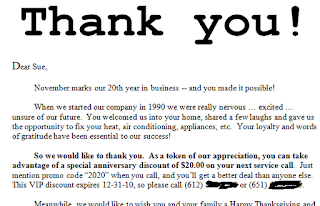 The easiest way is to hold a client appreciation sale. Create a special offer only for current clients. Write and mail them a letter inviting them to take advantage. It's that simple. "I am so grateful you came into our lives. 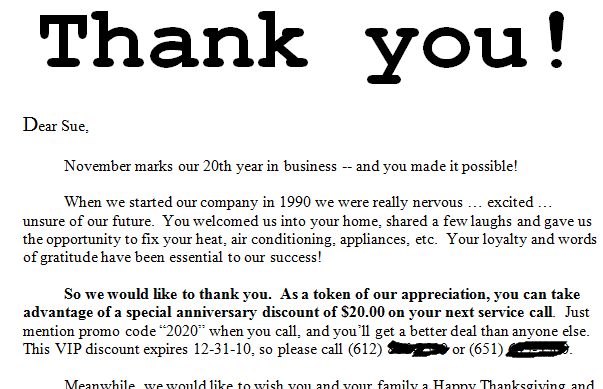 You wrote our '20-year anniversary' sales letter of appreciation -- this resulted in 50+ service calls. Nothing could be finer!!!" 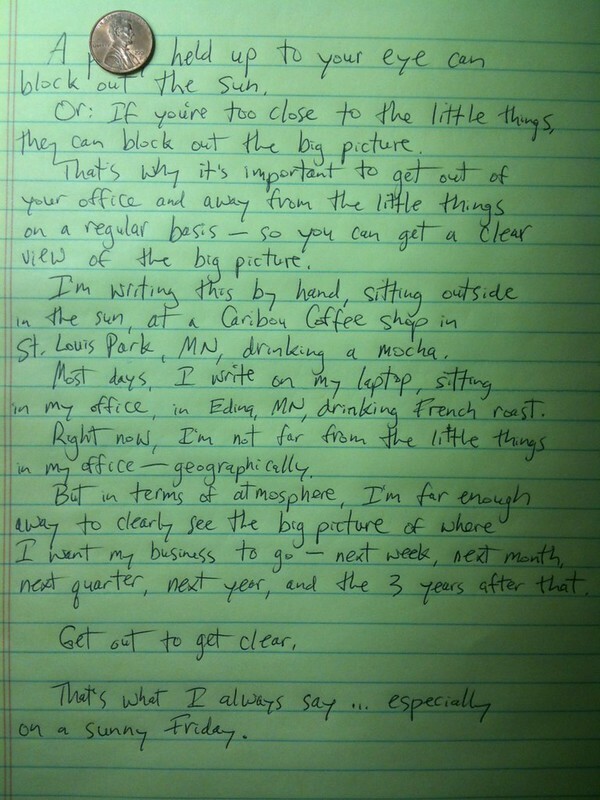 This is a sales letter. It takes days and costs relatively little. Examples: advertise more (roll a successful promotion out to another medium) ... advertise better (test continually) ... use more testimonials from clients in your ads ... create a unique selling proposition (Why should I buy from you?) ... use a money-back guarantee (to remove risk). 2) Get clients to spend more. 3) Get clients to buy more often. 4) Get clients to refer others. New ideas like these can extract profits from your business that you never thought possible -- or even knew existed. Why not pick just one and try it today? Bio: Kevin Donlin can help you grow your business and enjoy the results your hard work deserves. To learn how to boost your revenues and profits faster, please click here. As I first learned in the book Linchpin, Ed Sutt made small changes to an everyday item and, in the process, invented a revolutionary device that will save countless lives. You see, Ed Sutt invented a better nail. And yes, this has PLENTY to do with building your business. In 1995 a Clemson University graduate student named Ed Sutt took off for a spur-of-the-moment trip to the Caribbean. But beaches and rum drinks weren’t on the agenda for this civil engineer. Hurricane Marilyn had just torn through St. Thomas, and Sutt was part of a team examining how and why 80 percent of the island’s homes and businesses had collapsed in the storm’s 95mph winds. A house is as strong as its weakest nail, just as a chain is as strong as its weakest link. Weak connections lead to catastrophic failures. Think about your business. Does it ever feel like you're facing hurricane-force winds? If so, you may fear that your business is failing. But ... perhaps, it's not your business that's failing. Perhaps it's what's holding your business together that's failing. And that would be relationships. Relationships hold a business together, just as nails hold a house together. The more personal relationships you have -- with clients, vendors, partners, bloggers, followers, church/temple/mosque members, et al -- the stronger and more resistant to headwinds your business will be. Your weakest relationships could lead to a catastrophic failure in your business. You might want to nail them down.